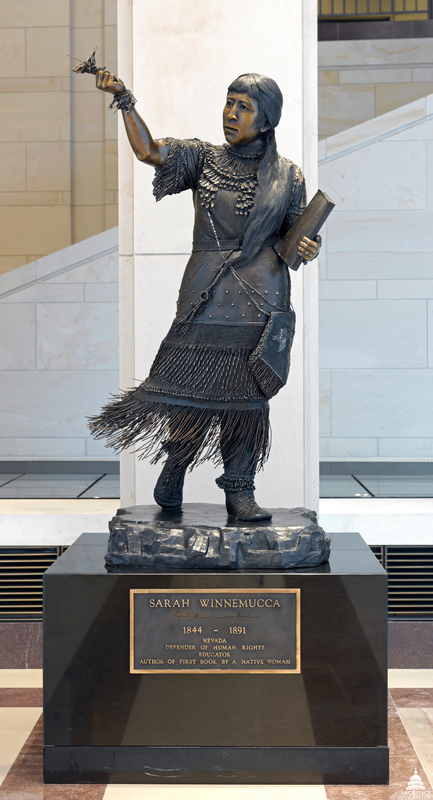 This statue of Sarah Winnemucca was given to the National Statuary Hall Collection by Nevada in 2005. Sarah Winnemucca (1844–1891) was a member of the Paiute tribe born in what would later become the state of Nevada. She was the daughter of the Chief Winnemucca and granddaughter of Chief Truckee. Her Paiute name was Thocmetony (or Tocmetoni), which means "shellflower"; it is not known why or when she took the name Sarah. Having a great facility with languages, she served as an interpreter and negotiator between her people and the U.S. Army. In 1878 when the Bannock Indians revolted and were being pursued by the U.S. Army under General Oliver Howard's command, Sarah volunteered for a dangerous mission. Locating her father’s band being forcibly held by the Bannocks, she secretly led them away to army protection in a three-day ride over 230 miles of rugged terrain with little food or rest. As a spokesperson for her people, she gave over 300 speeches to win support for them, and she met with President Rutherford B. Hayes and Secretary of the Interior Carl Schurz in 1880. Her 1883 autobiography, Life among the Piutes: Their Wrongs and Claims, was the first book written by a Native American woman. She started a school for Native Americans, where she taught children both in their native language and in English. She was married at least twice, first to Lieutenant Edward C. Bartlett and later to Lewis H. Hopkins. Sarah Winnemucca died in 1891. The bronze statue depicts Sarah Winnemucca as she looked around the age of 35, with hair falling to her waist. She wears a dress adorned with fringe that swirls as if windswept; this and her stance impart a sense of movement. In her right hand she holds a shellflower aloft and with her left arm she holds a book at her side.